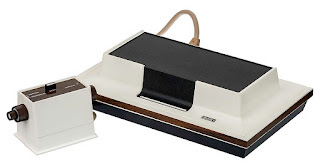 Just for fun, but maybe useful for someone, I'm documenting some classic home video game consoles. I'll stop before I get to Playstation 1. All release dates are for the U.S. versions. And I know there are many other systems I haven't included. I'm okay with that. I confessed to my friend Ted last week that I had done a crummy job of Bible reading lately. Well, for a long while, actually. I'm more likely to pick up a comic book than the Bible. 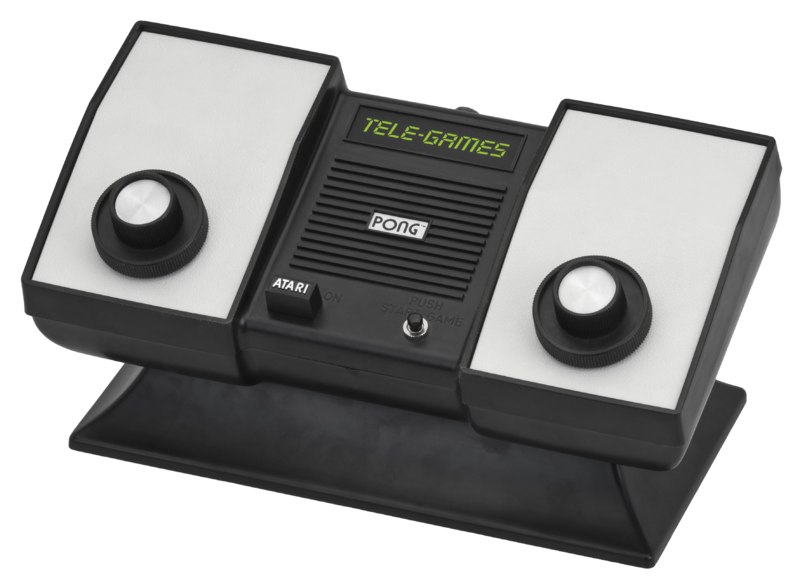 I'm more likely to play Atari games than read the Bible. I'm more likely to do just about anything than read the Bible. Don't ask why. I don't know why. I have no excuse. I walked home from work on Thursday. It had rained a couple hours earlier. One of those summer afternoon rains that catches you off-guard from outside the window. But it wasn't raining now, and I felt like walking. I'm always fascinated by being "among the people" on the bus, but sometimes it just feels good to hoof it. Roughly six miles to my brownstone apartment, it was a decent walk that would give me plenty of time to unwind. I'm a fan of abandoned things. Abandoned vehicles, shopping malls, playgrounds, churches, houses. There's something so profound about such things. I think I love them because they remind me of how temporary all this is. Everything we cherish here on earth will pass away. Or maybe we will pass away before it will. Abandoned houses are the best. I always imagine the day the first family moved in. The joy as they started their lives in this house that they built or that they saved up for and purchased. And all they experienced while they lived there. The birth of a baby, an argument over something silly, a dance across the kitchen floor, heartache, laughter, tears. A house is a shelter to protect us from the cold and the rain, and it's a place where we experience happy moments as well as tragedies. So much happens there. And then it's empty. I wonder what happened. Did the kids move out and the parents die? Did the house get flooded and condemned? How could a decent house, where there was so much joy, come to this? Boarded up windows, collapsing roof, vines growing everywhere. What happened? And then tonight, for the first time ever, I realized that my house will be like that one day, as well as every house I ever lived in. People might keep this house going for decades, full of life's best moments, but one day, it will be empty. Maybe it will be condemned, maybe it will burn, or maybe some folks (maybe us), will decide to just up and leave. Take the last train to Clarksville and let somebody else figure out what to do with it. Who knows what this house's story will become. But while we're here, before it, or we, go away, let's make some good memories, and maybe dance across the kitchen floor one more time. And then I looked at this web site's stats. Zero visitors in the past month. And of course that's with no advertising, no posting, and no caring. But still, it's like "Why bother?" I think I'll write that post about the house now. I had three comic book loves during my 1980's childhood: G.I. Joe, Transformers, and Thundercats, in that order. 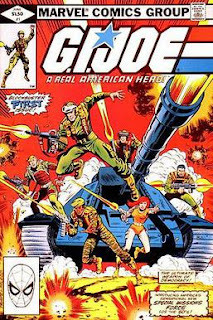 I had a love for these comics, but not the money or the stick-to-itiveness to get every issue. Not only that, but two of these series, namely G.I. Joe and Transformers, were published for years and years. They started before I was into comic books, and they finished after I had grown out of comics. Put all that together, and the result is a collection with no beginning and no end and many holes throughout. Say, issues 37 through 69 minus issues 39, 42, 47-49, 55-58, and 62-64. I like to experiment with coffee. Different beans, different temperatures, different brew methods, different roast dates... I could keep going. Coffee experimentation is generally good. As a relatively new coffee drinker, I'm learning what I like, and I'm "developing my palate" (coffee snob alert). Without knowing what I did in my last brew, I have nothing to build on. I was starting over with each and every brew. Sometimes I didn't want to experiment. I just wanted to do a known thing and get a known good cup of coffee. I had no set recipe to go back to for that perfect cup. 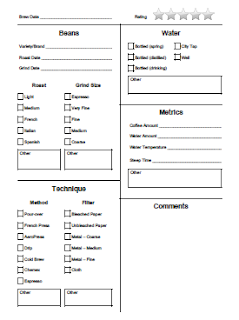 Enter the Coffee Checklist. It allows me to quickly record the details of each brew so that I can replicate a brew later on or build on the previous brew's recipe. I'm a bit obsessive by nature. A bit Compulsive. Some things bother me more than they should. Open cabinet doors in the kitchen, for instance. Oddly, a closet door can be standing wide open. No big deal. But a cabinet door? Forget it. I'm quietly freaking out inside until I can get in there and close that thing. So sometimes when I'm feeling saucy, I open a cabinet door and walk away (quietly freaking out inside). It's my way of showing my compulsiveness who's boss. Take that, compulsiveness. I'm building a dollhouse for my daughter. 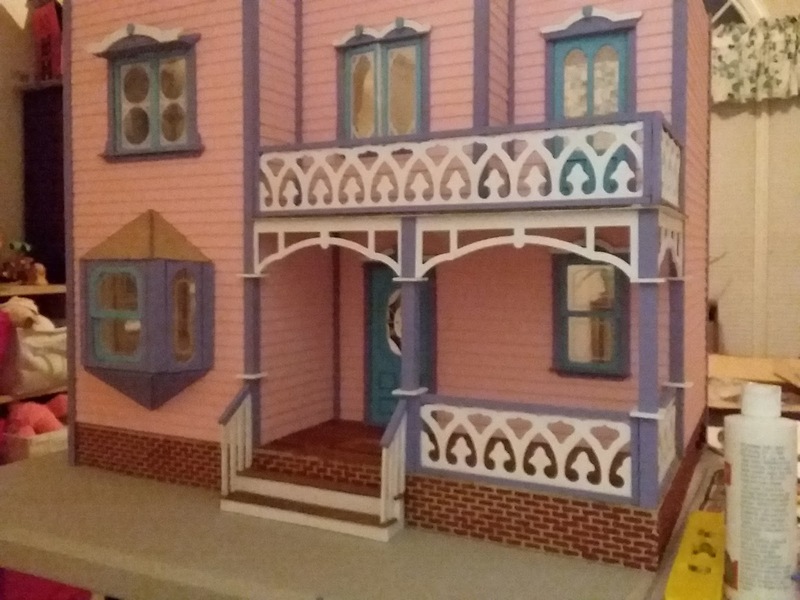 I've been building this dollhouse for three years. It has nine hundred pieces of balsa wood, most of which need to be individually cut out, painted, and glued. But the truth is that I haven't really been working on it for three years. I worked on it for maybe a week. Then I took a year off. Then I worked on it for a month. And then another year off. And for the past few months I've been working on it pretty steadily. I have learned a lesson: Don't take breaks. You take a break for whatever reason, and it's so hard to get started again. But when you do get started again, you realize that after this big long break, the work is still sitting there unfinished waiting for you. It didn't go anywhere. Your break did nothing but extend the schedule. 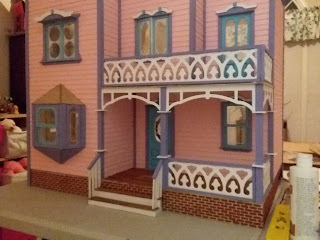 So now rather than give a really awesome dollhouse to a six-year-old girl who could enjoy it for several years, I'll be giving a really awesome dollhouse to a girl who's getting ready to age out of playing with dollhouses. If you are working on a dollhouse, don't take breaks. Put your head down and push through it. It will it be over before you know it. I'm a little grossed out by this, and I considered leaving it in the ground. But in the interest of science, I pulled it out and looked it up. Did you know you can date a can by its logo? Sure you can. You can do most anything on the internet. Diet Pepsi cans used this logo in 1986 (the centered NutriSweet logo is the giveaway), making this a thirty-plus year-old can. So why is this nasty old can so interesting that I'd make it the third post on my blog? It's interesting because it wasn't my yard back in 1986. It wasn't anyone's yard back then. Construction in our neighborhood began in the late 1990's. Prior to then, it was farmland and forest. I know that by looking at old aerial photographs. So what's a can like this doing buried a foot deep? I didn't mention the thing about the soil, either. On top of this can was red clay, common in this area and used as fill dirt. Under this can was nice rich black soil. If this was a can from 1999, I'd say a construction worker threw it down, and then it was covered with fill dirt while grading the land. But this can is 13 years older than that. I still like the idea of it being covered with fill dirt, though, because of the red clay versus black soil. Perhaps there was a different construction project going on here in the 80's. Maybe the farmer was leveling the land for the purpose of planting a field, or moving dirt to form an irrigation ditch. Or, maybe it actually was a construction worker in the 1990's. Only it wouldn't be his Diet Pepsi can; perhaps he found it on the property and gave it a toss into the bulldozer's bucket. It's worth mentioning that I also found a metal bucket in this very same location and at the same depth. I'll post about that at a different time. 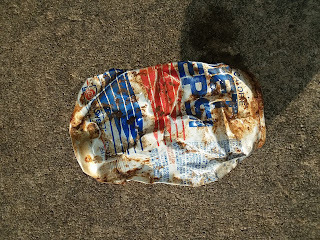 UPDATE: Today I was out digging in that same location, and I found a second 1986 Diet Pepsi can. It was interesting the first time. A second can, though? Not so much. I tossed it in the recycling bin on the way back to the house. But hey, if I find a 1989 Diet Pepsi can... that's good history right there. Item Creation Date: Early 1900's? Look at this thing! It's awesome, right? 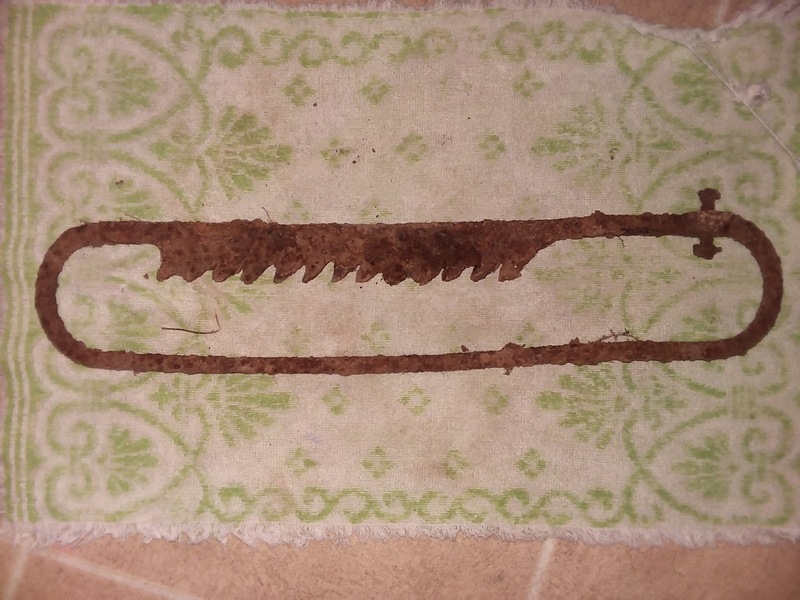 When I dug down through the dirt, the first thing I found was the area with the teeth, and I thought it was a saw. I pulled it out, and I had never seen a saw like it! It's oval, has teeth on one side, and it has two holes for bolts (with one bolt still intact). I posted it on a metal detecting forum and was informed that is not a saw at all. It's in fact something called a brake ratchet. It was part of the braking system of an old horse-drawn wagon. You can see such a wagon on the South Yuba River Park Association web site, and if you scroll down through the pictures on that page, you can find a photo that includes a brake ratchet like this one. According to that web site, these wagons were made starting in 1850, but there's no guarantee that the earliest models had this style of brake. I did find a patent for "new and useful improvements" to ratchet brakes. That patent is dated 1902. It's hard to date this item beyond that, but I do like to think that this thing is 100 years old. I love (like, a lot) the idea that someone 100 years ago was riding on a wagon over this property. This area was farmland, so he was probably hauling hay or bushel baskets of a recent harvest. Cool! Copyright 2015 My, That's Good Soap Company. Watermark theme. Powered by Blogger.